Over 2.5 total goals is one of the most popular and commonly used markets in football betting. Punters often discover that picking correct selections from that market is a little easier then predicting outright results for the same set of fixtures. Naturally, some teams are involved in high scoring, action-packed matches more often than others, and clubs with consistently healthy goal per game averages are fantastic options to consider in the aforementioned market. 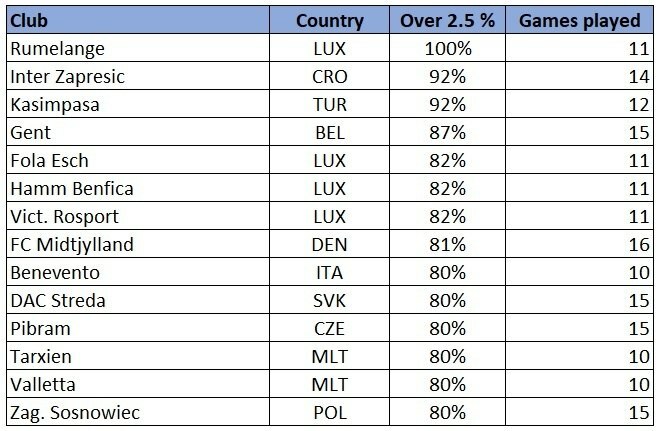 To help you get a better idea of where the goalmouth action is most likely to occur over the coming weeks, we’ve compiled a detailed list of the clubs across the globe with the highest over 2.5 goal per game averages and percentages. Unsurprisingly, French champions and league leaders Paris St. Germain have been pasting teams left, right and centre in Ligue 1 this season. The Parisians have scored 45 times in just 13 league fixtures in 2018/19 so far, which breaks down to a staggering average of 3.46 goals per ninety minutes of Ligue 1 action. 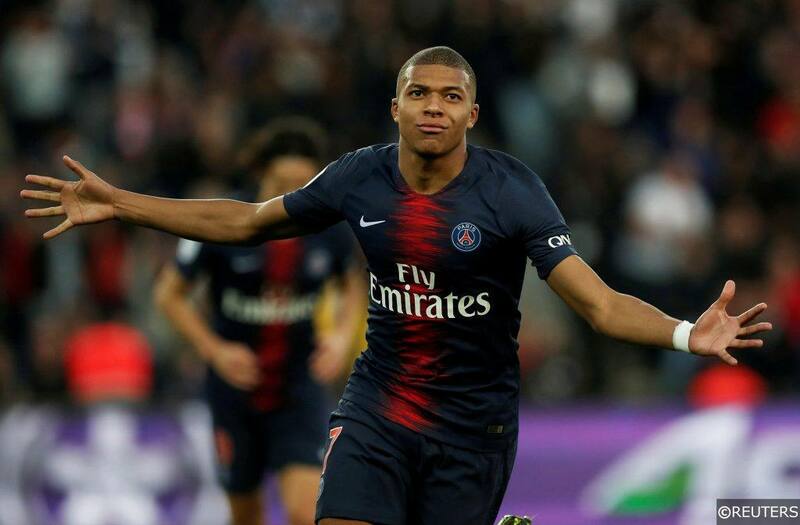 12 of PSG’s 13 Ligue 1 matches finished with over 2.5 goals scored in them – only their 2-0 win at Marseille on October 28th fell below that high scoring threshold. Julian Nagelsmann’s Hoffenheim have been giving supporters their money’s worth this season in the Bundesliga. 10 of their 11 league contests to date in 2018/19 saw a minimum of 3 goals fly in over the duration of the game. Ironically, the only match that failed to reach the dizzy heights was Hoffenheim’s 1-1 draw with fellow goal fetishists Borussia Dortmund on September 22nd. An eye-watering 73% of Der BVB’s league games this season finished with over 3.5 goals registered in them. Premier League strugglers Manchester Untied and Eredivisie champions PSV have seen over 2.5 goals in 83% of their respective fixtures since the summer, while Bundesliga outfit Borussia Monchengladbach’s figure stands at 82%. Incidentally, Hoffenheim meet Borussia Monchengladbach in about a month’s time on December 15th at the Rhein-Neckar-Arena. The last 3 meetings between the clubs produced a total of 18 goals. Luxembourgian club UD Rumelange top the charts in our Minor European Leagues table, having seen over 2.5 goals hit the net in 100% of their 11 National Division matches this season. Unfortunately for the side from the country’s south-west, they top the pile for all the wrong reasons. The newly promoted outfit have been on the wrong end of some absolute tonkings this season. Rumelange shipped 38 goals in 11 league matches since the summer, including 17 in their last 3 National Division fixtures alone. In total, their league games have averaged just over 5 goals per ninety minutes this season. Rumelange are joined on our list by fellow Luxembourgian clubs Fola Esch, Hamm Benfica and Victoria Rossport. Elsewhere, 13 out of 14 or 92% of Croatian side Inter Zapresic’s 14 league matches this season have had over 2.5 goals scored in them. That 92% figure is mirrored exactly by Turkish club Kasimpasa, while Belgian side Gent’s over 2.5 total goal percentage for the season stands at 87%. Gent are the 4th highest scorers in the Belgian First Division A so far in 2018/19, though De Buffalo’s have the 3rd worst defensive record in the competition too. In total, 57 goals were scored in their 15 league fixtures since August, which is an average of 3.8 goals per ninety minutes. Interestingly, both teams scored in 73% of Gent’s fixtures too. Italian Serie B side Benevento are an interesting entry on our list. The Italian second tier is generally quite a low scoring division, where over 2.5 goals have been scored in only 50% of the fixtures there this season. Benevento’s over 2.5 goals figure of 80% is almost twice the league average. FC Goa have been the team to watch in the Indian Super League this season. The table toppers are comfortably the highest scorers in the division having netted 21 times in their 7 league matches so far this term. Only 3 clubs in the 10-club competition have conceded more often than the Gaurs however. FC Goa’s fixtures have averaged 4.7 goals per game in 2018/19 and 100% of their league games to date finished with over 2.5 goals scored in them. Leaders of the Bolivian Primera División, Club San José, have been consistently delivering the goods and goals this season in their attempts to win their first domestic title since 2007. 18 of their 20 league matches in 2018 have had at least 3 goals scored in them. Approximately 1,500km north west of Club San José, Peruvian club Ayacucho have also had fans on the edge of their seats this season. After 14 Peruvian Primera División matches, Los Ñes are the league’s joint highest scorers, though they hold the second worst defensive record in the Peruvian top flight too. If we spin 14,500km back in the opposite direction, across the Atlantic Ocean to Qatar, we find Stars League side Al Sadd entertaining the masses in Doha. With former Barcelona star Xavi and ex-Atletico Madrid skipper Gabi, whose combined age is 73, pulling the strings in midfield, Al Sadd have scored a whopping 45 goals in their 10 league matches this season. Over 2.5 goals were scored in 8 of those 10 league fixtures. Categories: Betting Strategy, Blog, and Football. Tags: betting advice, betting strategy, betting tips, manchester united, over 2.5, PSG, and total goals. Team Tag: Borussia Monchengladbach, Hoffenheim, manchester united, PSG, and PSV. League: England Premier League, French Ligue 1, and German Bundesliga. Sports: Football.